Fall armyworm (Spodoptera frugiperda) (FAW): FAW continued being a problem to maize and other crops in southern and eastern Africa during February. African armyworm (Spodoptera exempta) (AAW): AAW outbreaks were not reported during February in the central northern outbreak region, but the seasonal breeding period has started. In Malawi, FAW was first detected in the southern part of the country in November into December 2017 and spread further and is expected to reach the northern growing region following cropping patterns which is influenced by the rainfall pattern trailing behind the ITCZ-based seasonal movement. The pest continued to cause damage to maize in most regions of the country. Since the beginning of the cropping season in November 2017, the Ministry of Agriculture provided more than 40,000 litres/kg Chlopyrifos, Cypermethrin and granular pesticides to affected farmers to carry out control (IRLCO-CSA). In Zimbabwe, FAW continued affecting maize in all 10 provinces. The Ministry of Agriculture was assessing the severity of the situation and assisting farmers with material and technical support. In Mozambique, all 10 provinces reported FAW on maize and Ministry of Agriculture provided material and technical support to affected farmers to control the pest. 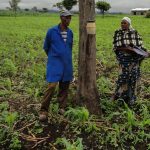 The pest was also reported in all 10 provinces of Zambia and the Government facilitated control by providing pesticides, spraying equipment and technical assistance to farmers. In Tanzania, the pest was reported across 18 regions of the country where patchy and mild to severe damage was reported. In Kenya, FAW attacks have decreased as irrigated crops had reached maturity (IRLCO-CSA). In Ethiopia the pest was reported in six administrative regions where more than some 17,115 ha of some 130,000 ha were affected as for the third week of February. 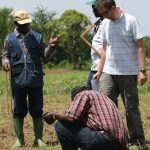 The pest was primarily reported on irrigated and short rain maize cropsand control operations protected more than 5,460 ha using cultural means (involved more close to 14,000 farmers) and with pesticides (further detail is being awaited (PPD/Ethiopia). In Somalia, PPD staff reported FAW in irrigated sorghum, but further detail was not available at the time this bulletin was compiled. As of January 2018, UN/FAO reported the presence of FAW in almost all of sub-Saharan African countries, but Djibouti, Eritrea, Lesotho, Mauritius and Seychelles. In February, a few FAW larvae were detected on irrigated maize plants in Djibouti (field staff). AAW outbreaks were not reported during this month. Forecasters are advised to monitor the pest and manage traps regularly (IRLCO-CSA, OFDA/AELGA). FAW: FAW will remain being a threat to irrigated and rain-fed maize and other crops across several regions in Africa during the forecast period. 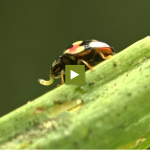 This situation has been prominent in countries with bimodal rainfall patterns and in irrigated crops which allow uninterrupted presence of host plants for the pest to survive and continue breeding and cause damage to crops. Active surveillance and timely reporting and interventions remain critical. AAW: AAW outbreaks are expected to appear during the forecast period in the central northern outbreak areas in Tanzania and perhaps, Kenya, in areas where seasonal rains have been reported, and cause serious damage to crops and pasture. Trap operators for AAW [and FAW as applicable] are advised to actively monitor their traps. Trap monitoring must be accompanied by routine crop scouting to detect egg and larval presence. Egg and larval detections must be reported instantly to facilitate timely preventive control interventions. Moth catches must be reported to forecasting officers and concerned staff and authorities immediately to help facilitate rapid interventions. Vigilance and timely preventive interventions remain critical to avoid crop damage (IRLCO-CSA, OFDA/AELGA, DLCO-EA). This forecast comes from and uses material provided by DLCO-EA, IRLCO-CSA and OFDA/AELGA. It was originally issued by USAID’s Emergency Transboundary Outbreak Pest (ETOP) programme and is summarised here by the Armyworm Network (@spodoptera007) hosted by Lancaster University.